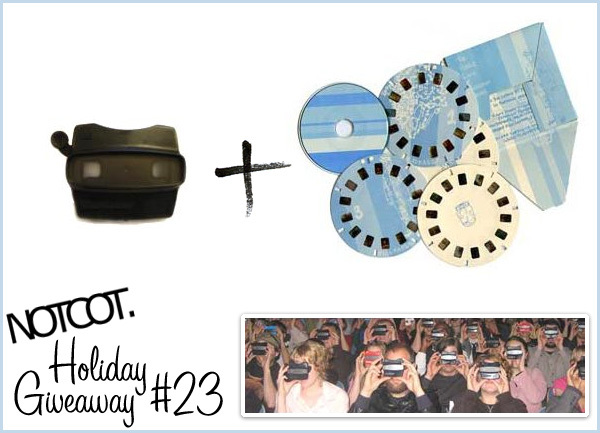 TO WIN: Leave a comment ~ have any viewmaster stories? ENTER BY 12/11. WINNER: Vanessa in London! In essence, who doesn’t need a a viewmaster and some handmade reels filled with artistic recreations of classics? 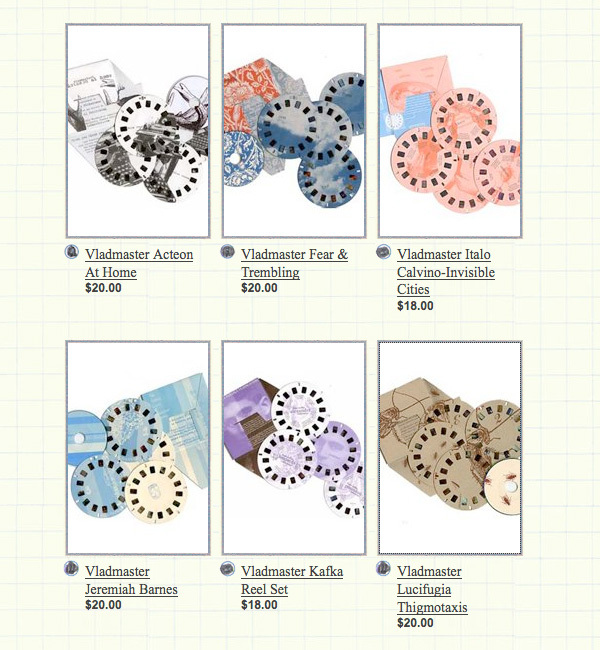 See the options on the next page ~ and leave a comment with a viewmaster story for a chance to win! Don’t forget the coupon from the NOTCOT Holiday Coupon Book! As a nipper, about 7 or 8, I had one of the bright red viewmasters and sat by the window in my room going through slides of capital cities. This caused some controversy with the elderly neighbour opposite who did not have a viewmaster and came round to complain about me taking photos of her from my bedroom window. Hilarity ensued for everyone apart from me who just wanted to get on with looking at Paris. i love view masters, mickey mouse gave me one in disney world after i fell down. i was 4. I have adored viewmasters since I was 3 and had 3D sesame street reels. I used to have the classic red viewer when I was younger. Since rediscovering my love for viewmaster, I have a acquired a multi colored viewer that is partially see though so that you can see the working parts inside. I love it but it doesnt work that well; it sticks a lot. My favorite reels that I found are of pretty women at a bird sanctuary in the 50’s. I would cherish a new viewer and reels! 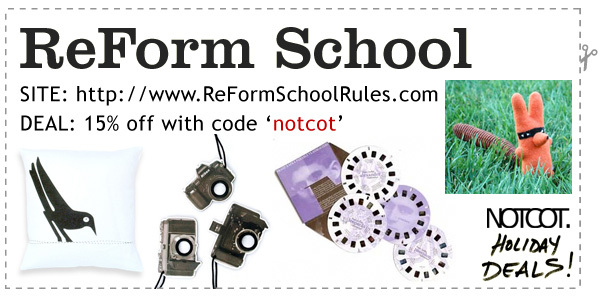 When I was a wee lad my favorite viewmaster reel was the Flintstone’s. It was my first 3-D viewmaster reel and I couldn’t stop viewing it. I love how Fred and Barney looked so real and I loved the scenery. I remember watching pictures from Disney movies on my viewmaster when I was little. It was fun to imagine the entire movie in your mind from only a few frames. Whenm I was a wee little KC, I LOVED my viewmaster, until my sister snapped (she HATED the noise it made) and broke mine! Tragic! I think a replacement would help avoid thousands in bills at the shrink! I remember those! so cool! When i was 6, I accidentally had my sister, who at the time was 2, choke on a discarded viewmaster slide after I tried to compare the size of the slide to the size of my sister’s tongue. Believe me when I say I never tried that again! Oh the viewmaster. Stereoscopic imaging was first designed as an adult parlor toy, but now is used primarily for children. I used to have one with Sesame Street characters. I loved Sesame Street and my viewmaster. I placed a pog in my viewmaster. i never owned one, but my spoiled friend did. i remember him always getting the coolest toys from his dad overseas. revert back to the now, i wanted to put together my portfolio slides into a viewmaster then send it out to places where i want to work after college. but i believe someone already took that idea. if not, don’t steal it! I actually got to see the Vladmaster in action. It was a memorable experience - everyone got their own Viewmaster and reel and would click along to the audio when prompted, Viewmasters aimed towards the blank movie screen. It was interesting to have such a communal experience with a toy that is usually experienced alone. I never had a Viewmaster as a kid. My older brother had one, but he wouldn’t share. WAHhhhhhhhhhhhhhhhhhhhhhhhh! Thanks for a fun giveaway. My dad worked for Kodak and I used to cut up old slides and make my own reels. I once made a reel staring Cybil Shepard. (She was the kodak girl - remember????) I think I still have them somewhere, but my Viewmaster is long gone. I think I have a weakness for the classic Star Wars Trilogy posters for the earlier three movies… you know, the ones with the huge heads epically floating in space, small battle scenes clustered at their necks within glowing nebulae… I like those posters. Hopefully this is an okay place to comment on that! I grew up in an Amish community where view-finders were considered to the the devil’s work. Now that I have grown up and escaped their evil view-finder hating clutches, I would like to experience the magical wonder of this magnificent invention for myself. I’ve got a friend who’s planning on proposing via Viewmaster. True story. I used to have one of those mickey mouse viewmasters! That’s not the story though, I remember when I was little there was a tiny cafe that had all of their desserts on a pink viewmaster. I think that’s when I fell in love with cafes and those little lace cookies. I had a red viewmaster when i was a kid…i had new (i.e., 80’s) slides like muppet babies, roger rabbit, and disneyland, and some of my mom’s older ones too. omg, I remember these from 2nd grade!! Had so many fond memories of my childhood viewmaster. I spent countless hours viewing the superfriends and scooby doo. I really miss those and it would be great for my son to experience it as well! I don’t remember any particular childhood memories involving a viewmaster, but I remember quite vividly the sound it makes— the shuffle of the slide, the plastic click, and the sound of the spring as it unfurls with relief from the pressure of your finger on the button. I liked noticing the subtle differences in my viewfinders when I was little. Some had the flat, indented pulley you see above while others had a round bauble instead. The colours and shapes were also evolving from bright blues to fire-reds. Toys like this need to come back into play. Oh man. There were many hours of ViewMaster-y in my childhood. An Only Child’s best friend. These handmade slides sound amazing. When I was home for Thanksgiving this year, we dug through the closets looking for old toys my niece could play with. Lot of good memories in there, but my favorite was my old viewmaster complete with a full set of He-Man discs. She-ra is still pretty hot for a cartoon lady. viewmaster memory - Mary Poppins slide set, it was like i was in the movie MAGIC!! love this site some would say I am addicted!! not in design but the more i see here the more i think i have missed my calling! When I was little, I had the Little Mermaid slides. They were my favorite. Also, there was something about the feeling when I would push the lever down and it would make the clicking sound that I loved. It was the first thing I thought of when I saw this post. My favorite is the Viewmaster textbook on mushrooms published in the late 1940s with lots and lots of ‘shrooms (full title: Mushrooms in their natural habitats; illustrated with stereo-photos). I have one but its broken. My viewmaster only had disney scenes, which at 5 was great, but now this would be so much better! When I was a kid, I used to wear a viewmaster as a glass. Then, kid at school started to wear it too! After 2 days….everybody stopped with this stupidity! i dont have so much of a story as i do a nod to the fact that i have my viewmaster from childhood as well as my father’s from the 50s. very very cool. My brother never shared his Viewmaster with me, so i’ve never had the chance of owning one, let alone using one ! Sniff. My mom has started going through the *still* unpacked boxes from our last move … a mere 15 years ago. She’s rediscovering all sorts of things including my old toys. Every time I go home, there is a “new” toy for me to play with. About a month ago, she presented me with my old Viewfinder and I WENT-TO-TOWN. I was so excited to see my old friends from Fraggle Rock that I clicked through a little too aggressively and broke the Viewfinder :( I swear, it was really like being 6 all over again. Nothing could wipe that pout from my face. viewmasters were cool, but those little projectors that shot the viewmaster reels onto the wall were where it was at. i loved those… but looking back, i was missing out on the 3-d aspect of the viewmaster. hm. I always liked only half turning to the next image. It was like seeing in between the lines… like the part you weren’t supposed to see. That white space could’ve been anything. Pretty darn cool stuff. OMG!! i used to love this!! When i was a child, my parents got these for me for my birthday and i thought … this is the best thing ever. Vlad rocks! Do whatever, say whatever it takes to get these disks, guys. I still remember the feeling of magic looking through the viewmaster as a kid. It was a window into another world. When the instmatic camera (with the 110 size Kodachrome film) appeared on the scene, I discovered that I could take two exposures - one with each eye - poke out the commercial pictures in a viewmaster reel and replace them with my own magic images. It was crude and it was messy, but sometimes it worked - and when the third dimension “snapped” into place, it was nearly orgasmic. My brother and I LOVE Kafka, and we sure as heck miss our old viewmasters. I think the Kafka reel would make an awesome Christmas present for my brother. I think it’d be a big surprise for him too. I don’t know if he knows about the vladmaster. How awesome would the Metamorphosis be in 3D??? I definitely recall the awesomeness of my childhood viewmaster. If I remember correctly, Gummi Bears were my personal fave. When I was child I used to swap reels with a friend, who knew a friend who knew a friend…and so on, until we discovered that there were already 10 of us, and we all had the same classic red Viewmaster. We used to have Viewmaster afternoons whenever one of us would have a new batch of reels to view. It was lovely, now that I remember it. I kept all of my old reels in a green plastic recipe box designed for large index cards. It was lost in a Fit of Cleaning perpetrated by my mother after I moved out. All I have to say is that I don´t have a viewmaster storie….yet….as soon as I put my hands on one of those, boy, I´m gonna terror my coworkers badly with my own custom pics. I choose Vladmaster Fear & Trembling. I had one with grand canyon I think..oddly enough, I think it was blue? ye ole Viewmaster. Mine from long ago was buzz lightyear and woody related. still have it in the basement too! My grandma had one when I was a kid and it was the first thing I would run to when going there. She had an Arizona reel and there was a certain picture of Arizona’s beautiful red mountains and I would dream of being there. The best part about Viewmasters are that they look so real cause of the depth they have. Greatest childhood memory. When I was a kid, i used to watch Star Trek TNG… I always thought that Jordi Laforge (LeVar Burton) had a Viewfinder in his head, rather than just a visor. …i remember looking thru a viewmaster for the 1st time and believing i was seeing true 3-d for the 1st time. I had a red one with a bunch of animal pictures. Nothing too spectacular. Perhaps this will be better? When I was a child, my grandparents had a viewmaster with a bunch of sets of national geographic and bible story slides. I remember sitting by the low coffeetable, with the drawers that got stuck open, so we weren’t allowed to open them (but that’s where the playing cards were!) and looking at old pictures of balinese dancers with their arms at strange and beautiful angles, an elephant balanced on a ball, and Samson standing between the pillars. What a strange wonderful memory, thank you for stirring this. Also, how cool, to have such strange viewmaster choices. Calvino’s Invisible Cities is a favorite book, the cities are all women, I think, and their descriptions are descriptions of their personalities and temperaments. Wow. What a lovely discovery. Oh man I wonder where my old viewmaster is. One of the few toys I had growing up along with scrabble and legos. I really enjoy stereoscopic pictures, I even make my own! Once the cops came to my house when I was looking at my Viewmaster. They questioned what I was looking at. I told them about the sequence with some happy kids playing in their sandbox. They quickly hauled me off. I didnt understand until I realized it wasnt my viewmaster it was binoculars and the kids were my neighbors. Man that was embracing. I remember having a viewmaster, and I remember it rocked. I probably hit my little brother with it at some point, or more likely, he probably hit me with it. He was always reaching for the closest weapon, and in his hands, pretty much anything qualified. Dear Viewmaster, I miss you. i agree with cheryl, awesome idea for portfolio presentation. It has it’s flaws as well, but you would bet mad points to ship them a viewmaster in a box…. So, in my random need to rationalize, i decided that for my birthday i’m doubling up on winning a viewmasters for notcot. After moving, I lost my red and blue Viewmaster, I had easily 30 slides, ranging from 7 wonders of the world, to disney movies, to classic cars, to Mummets. It was very broad, I loved it so much, but this one in black, MATTE BLACK, IS SOOO MUCH COOLER! I want the Kafka slides! But the Jeremiah Barnes slides look fun too! I have a Christmas ornament that is a viewmaster and it actually had a few pictures to flip through, Quite amazing. When I was four, I was convinced my viewmaster could take pictures because my uncle would draw little pictures and pretend to pull them out of it. What fun it was to be a kid and to believe your viewmaster was magical. I wish things were that simple now. y’know zebras live in those things?! entire zoos and cartoon characters! i never had one as a kid but i definitely bogarted my friends during sleep overs. I loved my Viewmaster, and cherished my Scooby-Doo Viewmaster slides. However, a Viewmaster crossed with Holga-esque slides and literary references? Tailor-made for me. I have this great viewfinder with garfield comics in them! How awesome is that?? I had one as a kid- it was red…. My grandparents had a viewmaster in a box for when the grandkids visited. The only reels they had was an incomplete set of “The Pixies go to Mars”. I’d love to find out the end of the story! ugg i loved my veiwmaster!! i loved the hear to sounds that it made when you pressed the lever. i liked to press it half way and then go back over and over again. something about that sound, it was hipnotizing. I always thought it would be cool to showcase my portfolio thru one of these. I remember stepping on one of these when I was younger & crap it hurt! when i was young i had a lazy eye and could never get viewmasters to work, and yet still think that they are the nines. OMG. Had the Peanuts slides as a kid. Loved them more than anything! I once had a viewfinder. I once had slides for it. I lost the slides, but it was still fun to look through, while making the clicking sound with the lever. I may have led the neighbor kids to believe that I had magic slides that moved, and only I could see them. Smeh smeh viewfinder smeh smeh jetsons smeh smeh. i loved my red view master. it entertained me on many childhood road trips. i think my favorite one were the disney themed disks. i totally remember these!! i loved them as a child — my roommate works in the ER of a children’s hospital and she says they use them to keep the kids entertained. I use to have one of these when I was a kid,,, my favorite was Mickey Vs. The Giant… such a classic! I used to have a red one as a kid. Don’t remember what slides I had, but I do remember liking to look through it! I gave my one and only view master to a friend in a koala backpack last year to make him happy. I would love to get another one. Especially one that comes with something other than Disney World pictures. Oh finally a giveaway comment subject I can really relate to! I’ve had this bright red one as long as I can remember. This and my grandma’s caleidoscope were my magical treasures as a child. I have always had only 3 reels, which I could draw to detail by heart: Bambi, dinosaurs and exotic animals. I had forgotten I had it by a few years ago, but then I saw Albino Noi, a disturbingly wonderful movie and it gained a whole new meaning in my life. The movie was about an Icelandic boy, who dreamed of leaving the eternal winter for some Southern island, and he used to gaze at this picture of a perfect beach with his viewmaster, ans it symbolized everything for him. I searched for mine after that until I found it and once again looking at the old reels, something seemed to make more sense. Something nice and warm inside me. Really a wonderful thing to have had as a child, though probably it wouldn’t be as interesting and magical to shildren these days. i re-discovered the viewmaster after visiting the museum of jurassic technology several years ago. such a quiry place, and with viewmaster reels of some of their exhibitons! Cross your eyes. Cross your eyes. It’s great to see a Viewfinder as a giveaway. I loved mine when I was a kid. I loved hearing the sounds of the mechanics when depressing the lever to change the slide. If your finger accidentaly let the lever fly up too fast it would make this great spring reverb coil sound. It was great. Its not the classic red/orange, but very nice. I once mastered the view. Just once. I actually have a view master right now somewhere in my room. When I was a little kid, my maternal grandparents had an old school black viewmaster. Whenever I traveled to their house, I would pull it out with its shoebox of slides and sort through them until I found the Gulliver’s Travels movie stills. They were the best, as at the time I had not read the book. Good stuff. This is so awesome! I remember as a I child having tons of View Masters, they were definitely one of my favorite things in life back then. I may still have one or two back at my parent’s, but would be nice having one of these artistic ones. by the way, I have not said this, so.. HappyBday!! In high school, I played the role of Sonny in our production of Grease. For one scene, we were supposed to make it look like vintage americana so I found this great old viewmaster with a reel of the grand canyon or something in it. When I was on-stage I got so absorbed in it that I missed my cue for a line.